There is always plenty of work to do and the holiday season is no exception. Thanksgiving dinner was wonderful, but a lot of work. After hours of preparation, there’s the cleanup. What about Christmas? There’s more preparation for parties, dinners, decorations, shopping for gifts and all of this is done after employment hours. Sometimes I wonder why we do so much. Work can be stressful, strenuous and difficult. During those times I’ve dreamed of a genie (pun intended) granting my wish for less work and more play. 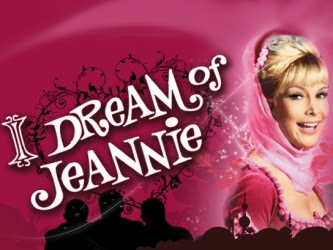 In my youth, I also loved to watch the fantasy comedy sitcom, Bewitched. I’ve thought how awesome it would be to have the magical ability to accomplish anything with a twitch of my nose, clap of my hands, or a snap of my finger and thumb, eliminating all the hard work. Have you ever thought of work as a blessing? Usually I think of it as the means to provide for the necessities of life. Without work, how do you pay for, prepare for, or participate in recreational activities and vacation time? Everything takes work, including the fun times. I didn’t realize the worth of work until after our car accident, which made it impossible for Mark to continue in the electrical career he was schooled and trained in. He dedicated twelve years to the trade and was successful, reaching the highest level as a master electrician. After eighteen months of rehab, he was anxious to get back to work. Realizing he wouldn’t be able to work as an electrician while in a wheelchair, he asked every day what he should do with his life. He said he needed to be productive to have self-worth and wanted a purpose for life. Work provides purpose. It was hard to imagine what he could do or that any other kind of work could bring him the fulfilment the electrical field did. I tried to convince him that rehab was his job. His focus should be regaining his physical and speech abilities so that he could go back to work as an electrician. Two years passed and he continued with his rehab, having eye surgery to fix his double vision and two surgeries on his feet to correct the foot drop, which made it difficult for him to stand. He continued to ask often when he could go back to work. I hadn’t realized before how important work is for making life worthwhile. Sometimes we don’t appreciate what we have or what we can do until it’s no longer available. We volunteered at our children’s elementary school twice a week, reading with the kids or helping with math and spelling. Mark enjoyed the kids, but sometimes they couldn’t understand him because of his speech impairment. Children are so honest and they would ask him often what happened to him or why he couldn’t walk or talk. These comments were probably harder on me than they were on Mark. I wanted to protect him and our own two children, wondering what questions and comments they had to endure. I was worried they might become discouraged or uncomfortable with our circumstances so I thought it would be best if we volunteer elsewhere. After checking into options with our church, Mark was able to do some volunteer work at the Bishop’s Storehouse posting food orders in the computer twice a week. He also went to my brother-in-law’s family music store to stamp their logo on their sheet music at Day Murray Music. He enjoyed and appreciated the opportunity to go to these places and volunteering his time, but he wanted to financially contribute to our family needs. The next year brought two more surgeries to fix Mark’s hip joints, which were filled with calcium, making it impossible for him to bend at 90 degrees. With his sight still set on getting back to work, I heard Mark often rehearsing electrical codes or terms so he wouldn’t forget them. He wanted me to pay the fee to keep his Master’s License current, but he was willing and wanting to do any kind of work until he got back on his feet. I had a hard time envisioning him finding any kind of employment because he was dependent on me for most tasks of daily living such as dressing, transferring in/out of the wheelchair and transportation, but wanting to support his goals, we pursued Vocational Rehab. He went through an intense week of testing. His I.Q. score was higher than normal, but his physical skills were low. The program helped place him in a part-time job at Discover Card. 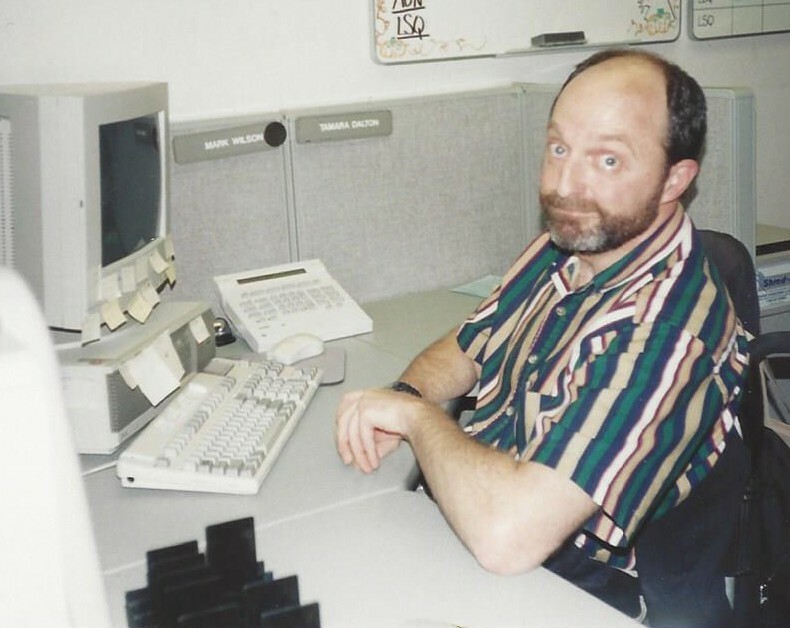 He did computer work recording P.I.N.’s (personal identification numbers) and enjoyed that job for eight years until they closed down the mail center. This was the appointed area for all the eight employees with special needs. They worked together with one supervisor who was trained to oversee and help each individual accomplish their job. Most of the special needs employees sorted the mail to the various departments and delivered them there. 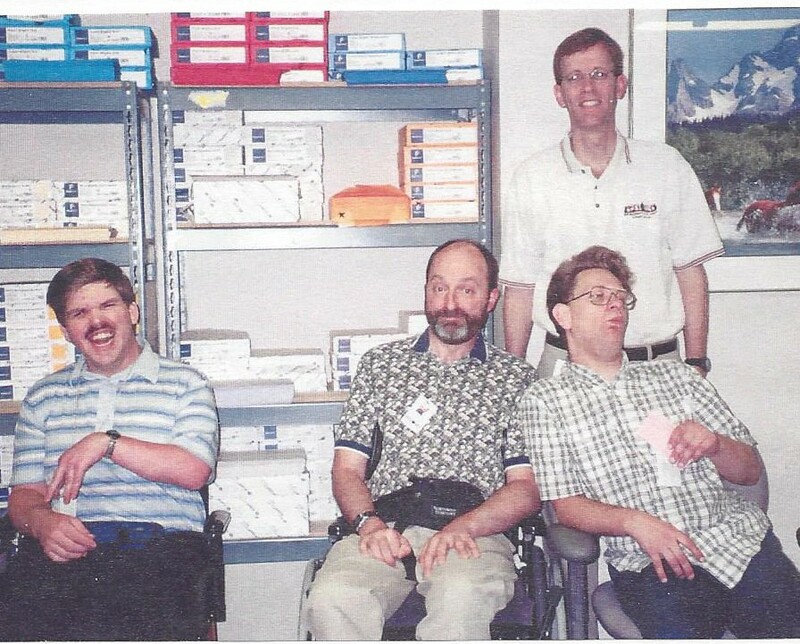 Mark worked on the computer, but because he needed help getting to and from the Paratransit bus to his desk, the restroom, lunchroom plus make sure he was stocked with the paperwork needed for his computer entries, his work desk was located in the mail room. He couldn’t do this job without the help of the supervisor. 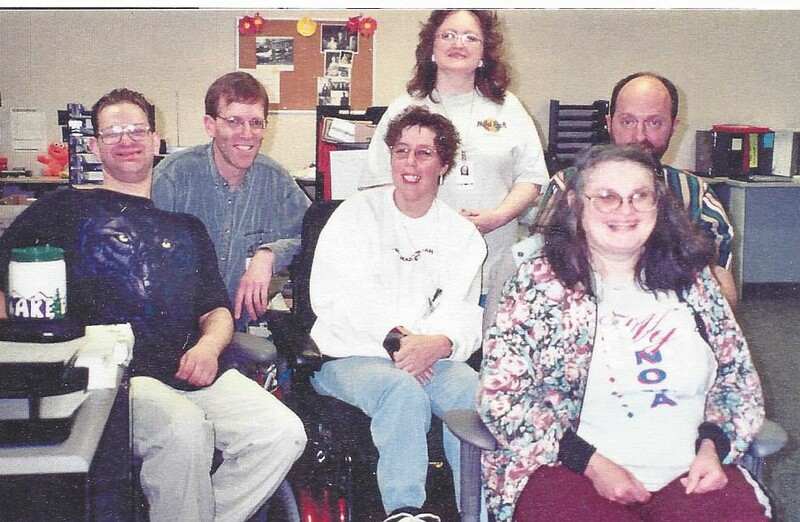 The group of special needs employees were devastated when they were replaced by equipment which sorted and delivered the mail to the various departments in 2004. What do we do now? I knew it would be hard to find a job where Mark would be safe and get the help he needed to accomplish work tasks. I also knew he wouldn’t be satisfied being at home every day without work. I learned the importance of work and realize its worth is so much more than the monetary value. Work brings happiness. Work is a blessing in disguise. We may curse it and wish we had less of it to do. I no longer dreamed of a genie to lighten the work load, but rather one who could help us find work for Mark. I wished I could twitch my nose, clap my hands, or snap my finger and thumb and make a job appear. On Tuesday I’ll share with you tips on how we found work for Mark. 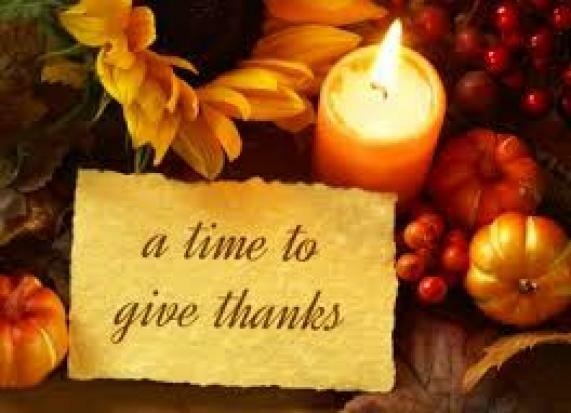 It’s that time of year when we are focused on giving thanks, yet every day should be a day of thanksgiving. But it’s hard to give thanks in all things. 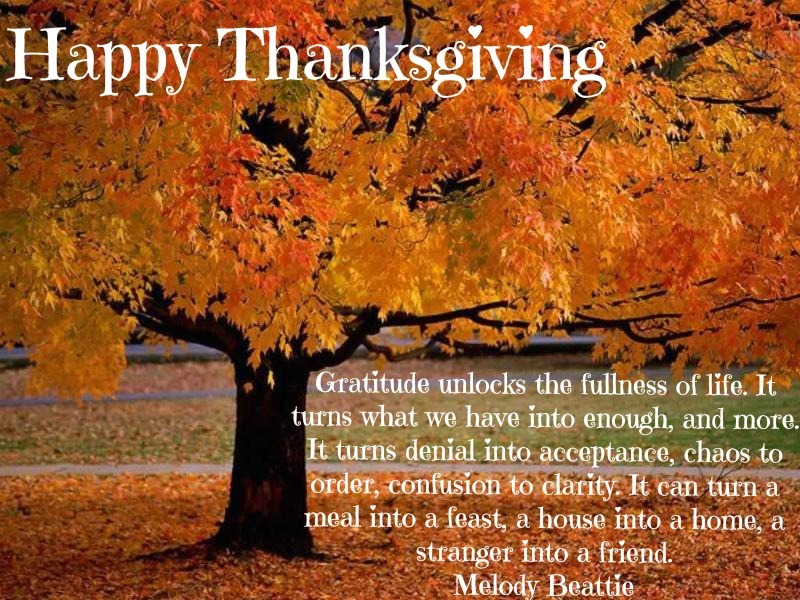 I haven’t thought of giving thanks for a car accident which caused my husband to be comatose for three months and hospitalized for rehabilitation for another six months. I’ve not said I was grateful for thirteen surgeries and years of therapy he’s had to have due to his traumatic brain injury. I’ve never thought I was thankful for an accident that caused him to lose his ability to work as a master electrician, seemingly wasting four years of apprenticeship schooling plus two years of journeyman experience and testing before earning his master’s license. It’s difficult not to envy people who can travel and do other fun activities as they please, while it’s problematic for us to visit the neighbor next door or a friend’s home due to stairs and a wheelchair that doesn’t climb them on its own. Life is complicated and unsettling when you live with seizures and have the worry of blood clots due to the inability to move freely. The list of concerns and complaints could go on, but I’ll spare you more grief. When I think about what we have missed out on and the unfulfilled expectations of life, I’m unhappy. I realize I need to change my focus and count my blessings. I should not compare my life to another—just my own. How far we have come and what blessings we have gained while overcoming our struggles. I am happiest when I recognize and appreciate what I have. I am thankful for life and realize every day is a bonus day and must not be taken for granted. I appreciate the education of doctors, nurses and therapists who have developed the skills to help heal and improve our health issues. I’m grateful for the hard work and progress Mark has made through surgeries and years of therapy, which has enhanced our quality of life. Because it’s challenging to travel, we find fulfillment in simple things such as gardening, canning, reading, writing, playing games, listening to music, putting together puzzles and other activities at home. I’m grateful for our comfortable, wheelchair accessible home, which always gives me something to fix up or improve and the space I need to be able to work at home. I appreciate my employment in property management which enables me to pay for all the necessary things in life. I am fortunate to have wonderful bosses and friends such as Steve and Rick. I appreciate all they do for me on in our business as well as my personal life. I am also blessed to live with Mom and Dad. I am grateful for their continued love and support and I’m thankful we can help each other in all things by living together. I appreciate my children, siblings, nieces, nephews, cousins, aunts and uncles, who I know I can count on for help at anytime or in any situation. They are the foundation for everything we accomplish along with the love and support of neighbors and friends. Many people volunteer their precious time to help us. With the loss of some abilities we have gained others. I am grateful for every course in life, good or bad, which gives us knowledge that can never be taken away or become useless. 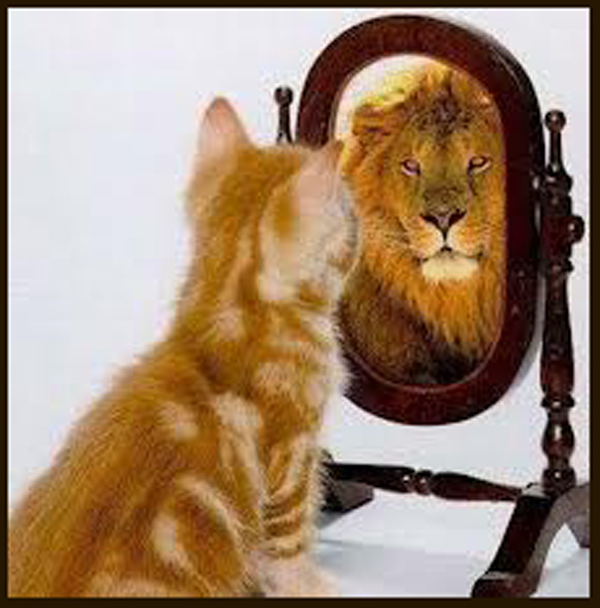 Our self-confidence improves as we realize we can overcome grueling circumstances. Our compassion towards others has grown, along with the ability to understand their needs and our desire to help has intensified. We no longer take for granted the human adaptability and the drive to conquer challenges. We are inspired by people’s good will and how they strive to do their best. 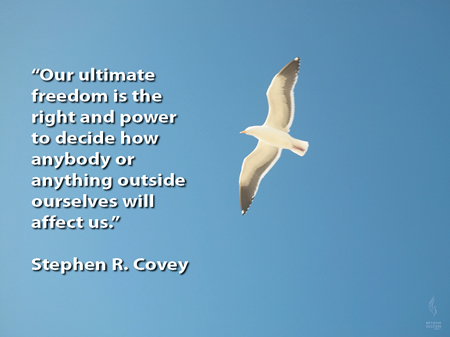 It gives us hope and the desire to do likewise. We are blessed by many people—family, friends and neighbors who give service, love and support to us. Our need to give back is the driving force for writing our story and developing Uniting Caregivers. This recent passion has brought new friendships through writing and caregiver’s support groups, along with readers and participators of this blog. I have learned so much and have gained from their experiences. I am grateful for the influence of other writers and their encouragement in my own writing endeavors. I appreciate my sister-in-law, Dianne, who edits nearly every article before I publish it to make sure I’ve punctuated correctly and that my writing makes sense. If you are reading this, I am grateful for you! I appreciate your feedback, whether it’s done with words or the click on the Like button. In just over a year, Uniting Caregivers has had several exceptional guest authors participate and nearly 16,000 views. I hope what is written has helped you find hope and encouragement in your trials. I have truly been blessed in my life’s journey and writing about our experiences manifests those blessings to me. So I must say—if I’m grateful for everything I’ve listed above, I need to be grateful for a terrifying car accident which switched our life’s track dramatically and helped me understand all that I’ve written and hopefully has changed me for the better! Every day should be a day of thanksgiving. When I focus on my blessings I am happier and life is easier. Being grateful makes what I have more than enough. While I appreciate the years of education a professional caregiver has, it’s still really hard for me to leave Mark at the hospital. I realize they can be an expert in their field working with people who have a wide variety of disabilities and illnesses. They may have the education and the skills of an excellent doctor, nurse or therapist, but that doesn’t make them an expert on the person they are treating. Even though I know this, it’s difficult to stay calm when they don’t know how to do something which seems obvious because it’s common to me such as transferring, bathing and the other daily tasks of caring for Mark. The memory of three hospital admissions in 2013 for blood clots is still etched perfectly in my mind. They didn’t know how/or want to transfer him so he was bedridden for a few days. I watched him get weaker as they treated him like he could not move. I asked the doctor if the nurses and aids weren’t getting him out of bed because of the blood clots. He said no, in fact, lack of movement brings on blood clots. I asked him to please order Mark some therapy, which he did. To my surprise, the therapist wheeled in a bedside lift. “I don’t use a lift to get him up,” I said. I watched anxiously to see how this would work. The harness was complicated and appeared to be new to the therapist. Mark was in a weakened state and this method of getting up took little effort on his part. He wanted to help, but was confused by this foreign process. It took nearly thirty minutes to get him in an upright position, leaving little time for walking. “He can walk with a walker,” I stated. The therapist looked at me like I was crazy. “I will bring it tomorrow and we’ll show you,” I said and the next day, I did just that. With assistance from the therapist and me, Mark took steps the length of the hospital room. The therapist was impressed and amazed he could do it. I was shocked at how fast he had weakened because he usually walked better and much further. It took the full month of August 2013 in a rehab center to build up his strength again. This hospital experience taught me I needed to let them know immediately Mark’s capabilities and I took the walker to the rehab center. “Sure,” they replied in unison. Standing directly in front of him, I lifted his foot and I swung the leg rest to the side to move it out of the way. I followed the same routine with the other foot while Mark unfastened his seatbelt. With his feet on the ground and carefully positioned with the foot closest to the bed out in front of the other, I placed my feet in front of his to hold them in place. I wrapped my hands over his shoulders and tucked a few fingers under his arms. With my knees pushing against his legs, I pulled upward with my arms as he stood. He’s 6’2” when he’s upright and his height usually surprises people when they see him stand for the first time. I used my legs to help direct him as we pivoted to the side of the bed and I lowered him to a sitting position. As he lay back, I picked up his legs and swung them onto the bed. “You do this by yourself every day?” the nurse asked. “It looks hard; you must be really strong,” she said. Some people may take that as a compliment, but I felt like she was saying, that’s too difficult for us to do. I left for work worried that he would be confined to the hospital bed all day long and when I returned at night my worry was confirmed. Someone had even written on the white patient information board in his room “bed rest”. “You have your routine and you’ve been taking care of him for a long time. It’s second nature to you, but it isn’t to us,” the nurse said. I knew she was right, it is second nature to me and not to them, but I was also right, he needs to move to keep up his strength. By both of us being assertive and expressing our concerns, we came to an understanding with a plan for physical therapy while he was there. I didn’t necessarily like that they wouldn’t get him up and it’s hard for me to understand that some nurses and aides are not comfortable doing transfers, but we found some middle ground. I realize that rehab centers are different than hospitals where the majority of the patients are capable of walking or transferring into a wheelchair with minimum assistance and transferring Mark does take more assistance. However, I do it every day so it’s an obvious part of caregiving to me. It’s not always easy to express what I think and feel in a positive way, creating mutual respect, when I view things differently than another. I don’t want to be passive by giving into what I don’t believe is right. If I don’t express my feelings, I get upset inside and after time it can build until I explode or become aggressive by yelling or being sarcastic. I don’t want to be disrespectful of others and their opinions. 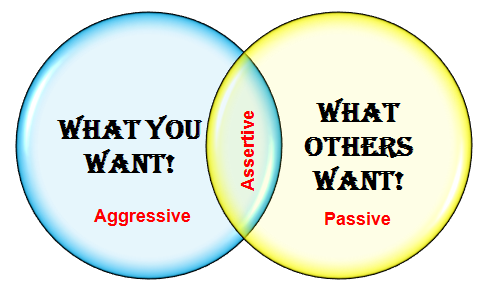 Being assertive is the ideal middle ground—where I want to be. Sharing what I have learned through my experience with professional caregivers can be intimidating and difficult. 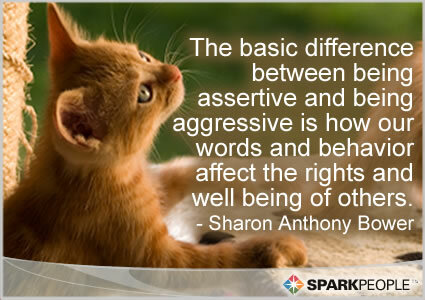 Tuesday I’ll share some great information I found on how to be assertive without offending another. What positive experience have you had sharing what you know in a difficult situation?